The September 2008 issue of Tradeshow Week named Columbus as the most affordable U.S. city for tradeshows. Results were based on the federal government’s 2008 Domestic Per Diem Rates for meals and incidentals, Smith Travel Research’s survey of domestic hotel rates and Tradeshow Week’s 2008 survey. At the heart of Columbus tradeshows and conventions is the Greater Columbus Convention Center. Greater Columbus Convention Center is located right in the middle of the vibrant downtown that’s alive with cultural activities, arts, sports and entertainment. 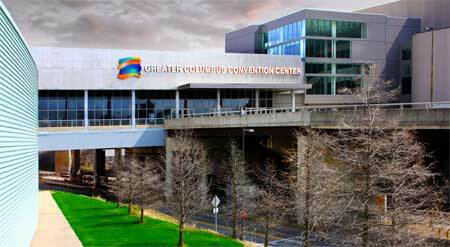 Hold your next convention, social event, public show and trade show at the Greater Columbus Convention Center, and discover what so many other people already know: This is a great convention destination. As the winner of multiple Prime Site and Inner Circle Awards, this comfortable, striking facility has become one of North America’s most popular sites for local, state, regional and national organizations. Excited reaction to the new Greater Columbus Convention Center traveled quickly through the industry in 1993 when the center first opened its doors. Five years later, the Greater Columbus Convention Center announced a major expansion and renovation due to overwhelming demand. We should mention that the building is very much worth visiting, since its sheer length, color and unusual angles are in obvious contrast with the surrounding urban environment. The color palette architect, Peter Eisenman used is much like that from the Aronoff Center in Cincinnati. However, the contrast created with its downtown neighbors makes the building stand out even more. For students of architecture, the Convention Center's close proximity to the Wexner Center also designed by Peter Eisenman, makes the short drive up North High Street worthwhile so you can compare two different types of Eisenman buildings. Directly north of the Convention Center is the Cap and Short North Art District that both offer unique dining opportunities. For a more eclectic experience, visit the North Market which is about 1 block directly west of the Convention Center as is Nationwide Arena and the new Huntington Park professional ball park. The Hyatt Regency connects directly to the convention center on the south end of the center. The Hyatt is also a block or so directly east of Nationwide Arena and the Arena District Dining and entertainment area. At the north end of the Convention Center across the street, is located the Hampton Inn and Suites. The convention center was designed by Peter Eisenman, constructed in 1993, and expanded in 1999. In an attempt to tame the large volume, Eisenman created a series of separate pavilions on the High Street facade, predictably canted at odd angles. These pavilions were intended to echo the rhythm of the brick facades on the opposite side of the street. The metallic colors originally proposed for the pavilions would have lent greater definition, but the pavilions are none-the-less blank.